Sometimes, even for us living here on Maui, the colors around us simply amaze and take your breath away. 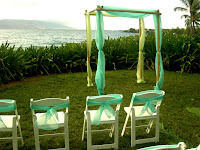 This arch, lime green and turquoise blue, in an afternoon setting sun, radiated a soft tropical ambiance that was quite unexpected. A thin cirrus cloud cover filtered just enough light to make it work. This location, South Maluaka, is on the Makena, Wailea, Kihei side of the island, and is relatively clear of most tourist traffic. The Bride, using Pacific Enchantment to coordinate, was thrilled!